I get the feeling that the off-duty National Geospatial-Intelligence Agency employee who drunkenly crashed a drone onto the White House lawn didn't know or sign on to the drone lobby's voluntary "Know Before You Fly" guidelines. 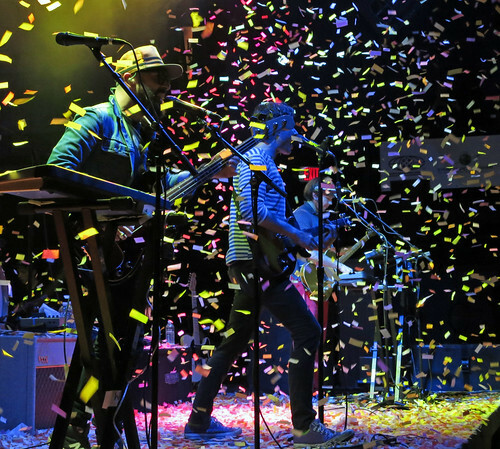 You know, the guidelines they were pushing just last week -- topped off by a free (well, mostly free) OK GO concert at the 9:30 Club? The one that says "Do not fly under the influence of alcohol or drugs"? And has a bit about not flying near or over sensitive infrastructure or property? Now, while it may not be great news for the drone lobby, I would guess that it's going to be great advertising for the DJI Phantom line. And on that whole "drone" thing -- sorry, guys: You've lost the "drone" war. Despite the connotations of the word drone that you don't like (Hellfire missiles raining death upon insurgents and wedding parties with equal impunity) and the fact that drone is, admittedly, a term that lacks nuance, the terms you're trying to push -- UAS (unmanned aircraft system), sUAS (the same, prefixed by "small"), RPA (remotely piloted aircraft) -- they've all got too many syllables. Get it down to cute nickname that's two-syllables (tops), then we'll talk about not calling them drones. 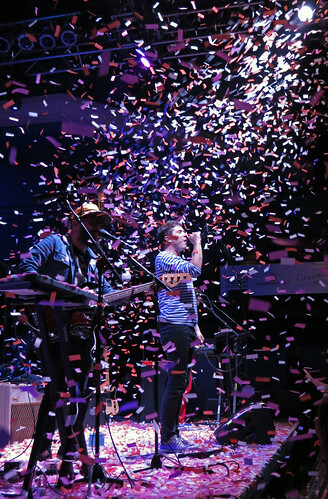 Anyway, here are my photos from the concert. 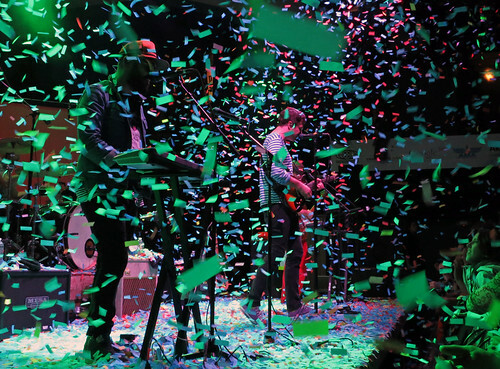 Doors were at 7pm, I got there around 8, so I can't attest to the existence of a pre-show drone advocacy timeshare-like presentation; all I know is that there were more jackets and ties than I'd ever seen before in the 9:30 Club, they showed OK GO's I Won't Let You Down, and some guy who I'd been standing next to at the front left of the stage (presumably, a bigwig from the Small UAV Coalition) got onstage and gave a short introduction. 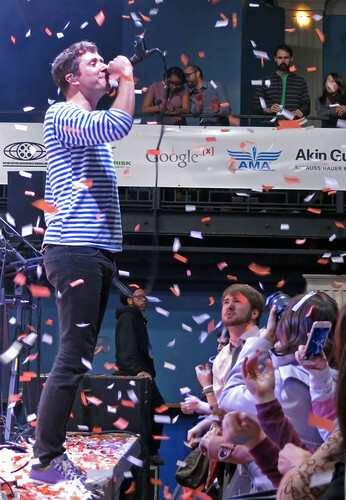 OK GO frontman Damian Kulash in front of adoring drone and/or OK GO fans. 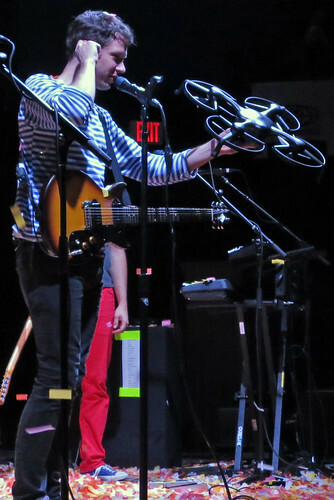 Damian Kulash with a quadcopter drone that someone was trying to exchange for backstage passes for their upcoming New York show. 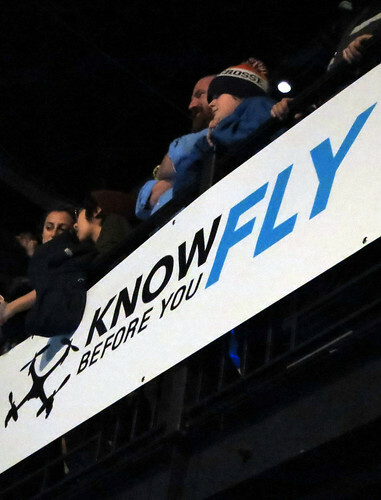 "Know Before You Fly" banner. 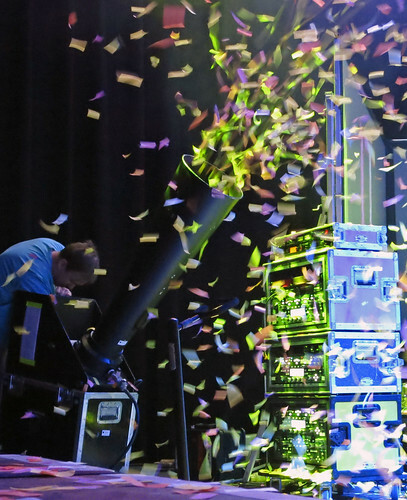 I took many pictures of the guy working the confetti cannon. This is the only one that I liked. 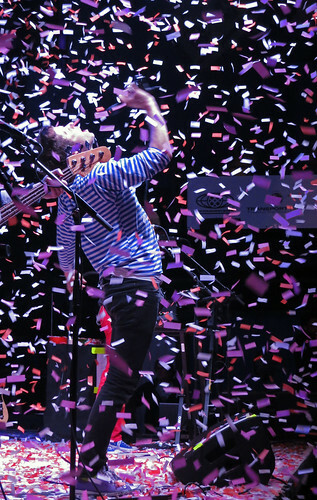 There was a lot of confetti. "Dad, why do you have a hammer in your pocket?"